Quirky NY Chick: Well Hot Damn, Bob Schneider On DVD! 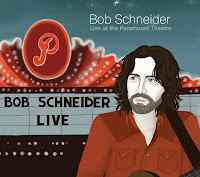 The next best thing to going to see Bob Schneider live would be having a DVD of Schneider live. Well, actually the next best thing to going to seem him live would be for him to stop by your house and play for you but, since that's not likely to happen, we'll have to settle for a DVD. Yes, ladies, gentlemen and random questionable but lovable sorts, Schneider has a nice shiny live DVD/CD set available. What's it called you ask? It's called Live At The Paramount Theatre. It was recorded last December in Austin at, as the title suggests, the Paramount Theatre. I've ordered mine ... big surprise there! Check out the trailer below for a taste of what you're in for. Speaking of live Schneider, he'll be back in New York on November 20. This time he'll take the stage in Brooklyn at the Knitting Factory. Y'all know he's one of those people I recommend going to see.